This is an excellent and tasty pate, made from red kidney beans, which can be used on bread, pita bread, with bread sticks, with celery sticks or peppers, or a part of main meal. You can obviously use other beans, such as black beans or cannellini beans. I like it a lot and I eat it by spoon. With peppers. Make it. 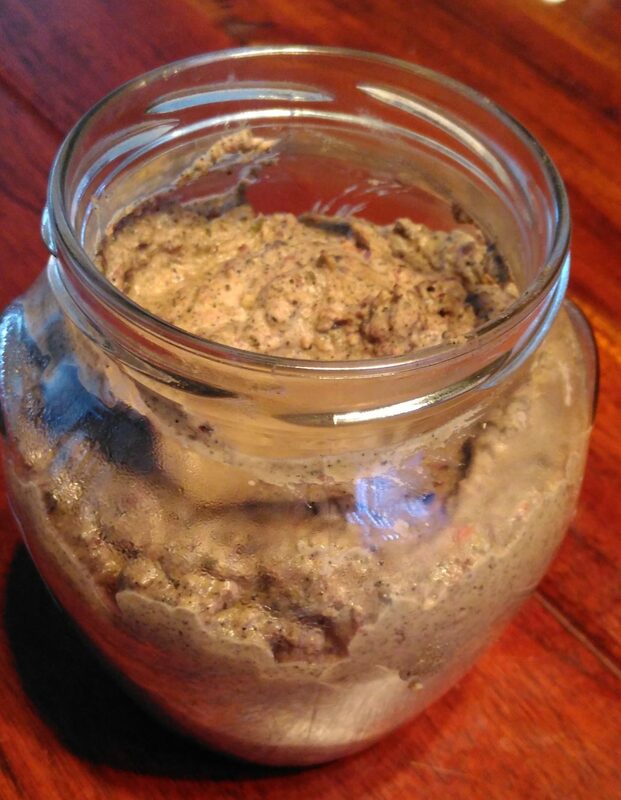 A fantastic, easy to make pate that goes along with nearly everything! Roast black sesame seed in a pan (no oil needed) for approximately 5min. Stop when you notice they begin to crack (open the hulls). Set them aside. Chop the onion, chili and pepper and fry in the oil (or butter). Add marjoram and tarragon if you like. Add smoked paprika and a pinch of cumin. Do it for 5 min. Add the chopped garlic cloves and fry for a while. Set aside. Chop the mushroom and fry them with a spoon of butter or oil, some salt and pepper, approximately 5min. Strain red kidney beans. Put all the ingredients into a bowl. This includes fried mushrooms, fried onion, garlic and peppers, roasted black sesame seeds, tahini, and red kidney beans. Blend it into a smooth pate. Taste it. If not smooth enough you may need to add some oil. Add more salt and pepper to taste. Store it in a clean jar in the fridge. It will keep for three days. Kidney beans are quite plain in taste so it is great to spice them up by adding more chili or garlic. Tahini as well as black sesame seeds add a deeper, somewhat nutty taste. In my opinion, it makes it excellent, but feel free to skip these ingredients. You can use sun-dried tomatoes (from oil) as an alternative to peppers. Red kidney beans should be pre-soaked (to reduce sugars which cause flatulence.) There are two simple ways to do it. After you have washed your beans, place them in a saucepan and add three cups of water per one cup of beans. Boil the beans for a couple of minutes, take the pan of the heat, cover it and allow it to stand for 2-3h. The second way I usually follow is to soak the beans in water overnight (or 8h at least). If it is relatively warm in the kitchen, keep the pan in the fridge to prevent beans from fermenting. Remove the water and rinse the beans with clean water. There are some debates whether the water from soaking is beneficial or not, so feel free to keep the “old” water. My main reason to disregard the water is to get rid of some phytates and tannins that make other nutrients less available for absorption in the intestines, as well as disregarding some flatulence imposing substances. Add the beans back to the pan and cover it with water, approximately 1-1.5 inch (2.5 – 4cm) above the level of beans. Add 2 bay leaves. Bring the liquid to boil and reduce heat to simmer, partially covering the pan. If there is any foam you can remove it. It will take 60-90min to cook them. Don’t use any salt and any acid during this process as it will make cooking much harder. You can add salt or other herbs at the end of cooking.